Your disc makes a great poi bowl. 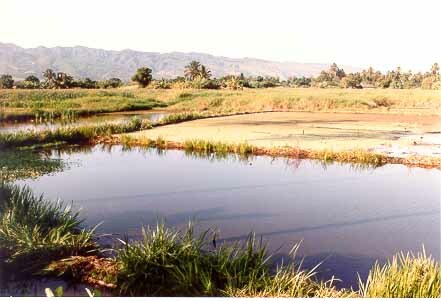 Taro grows in wetland patches similar to rice paddies. 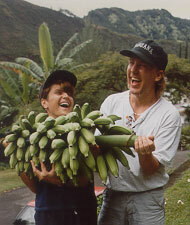 Above - harvesting apple bananas at home. 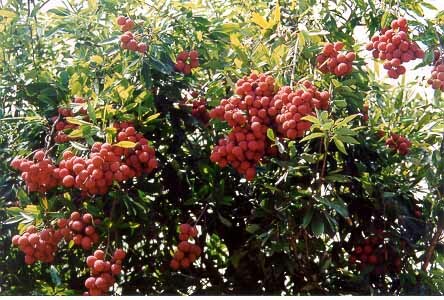 Below - lychee in the tree ready for picking. 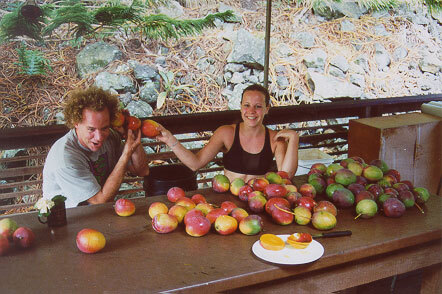 The best all-round choice of mango varieties is probably a Hayden (shown in the picture - Jim has them coming out of his ears). This variety is bright red and yellow when ripe, green and purple when green. These and most other mangoes are better less ripe than over ripe. Go for at least a smidgen of green color on the Haydens. The best flavored variety is a white pirie, although this one is both rare and difficult for new guys. It is not much to look at - plain green color - turns yellowish when ripe - a little tricky to tell. The most distinguishing feature is a little point near bottom (sorry, no picture). Although most mangoes are better on the unripe side, this one is best ripe and juicy, even over ripe. A fun, easy, and fairly neat way to eat a mango is to make a "mango flower". (You can see the remains of one that Lucy had in the picture.) You cut a side off, then cut a dicing pattern into the fruit with a knife, then flip the fruit inside out. 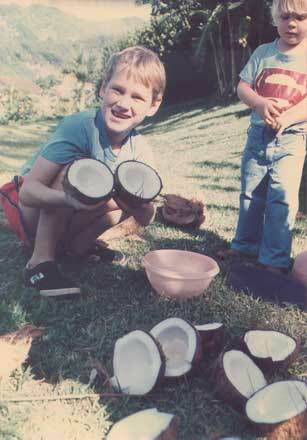 Poi is the food that Polynesians lived on for thousands of years. Nutrition-wise it is a fairly complete meal for an active person. It is a very high quality carbo. The best part for Ultimate players is that it is so easy. All you need is a source of drinking water. You buy the poi in a bag (about $4 at grocery stores) and toss it in your backpack (although better fresh and kept coolish, it keeps for days without refrigeration). When you're ready to eat, just add water to the bag and mush it around. 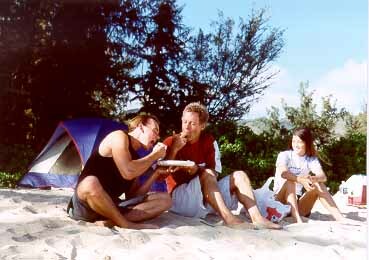 (Poi can be eaten with any amount of water. More water makes it less "dry" tasting, but if you make it too runny you'll need a spoon. Ideal mix is about 50-50, which gives you "two-finger" poi.) To serve, just squish it out into your disc. Eat with your fingers. Tomoe helped with concessions my first year with the Kaimana Klassic (a tournament in Feb put on by HULA). Here she is harvesting taro leaves. Let's get you some of our tasty tropical fruits. 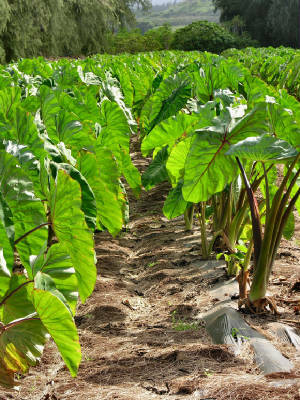 Most of the banana trees you'll see in people's yards are "apple" bananas (also called Brazilian bananas). Apple bananas are smallish and have a little nub on the end. You can find them in the stores for just a little more than standard bananas. Good flavor. Lychee will be a little out of season when you're here in August. Most are ripe in May, and there are a few varieties that get ripe in July and maybe early August. They're a little expensive but a treat. Papayas very common in August, relatively cheap, and very good. Easy to bruise and tend to be squeezed to death in tourist traps. Best bought 90% green and ripened a day or two. Most people like them best about 10 - 50% green. 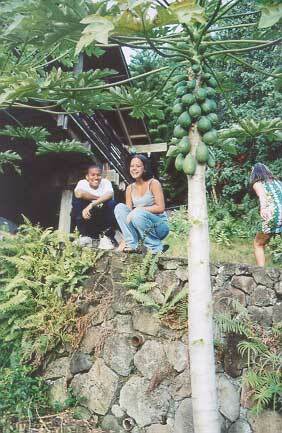 Mangoes are mostly pau (out of season) by early August, but you may find some. The best place to look is Chinatown. Mangoes are tricky and messy to cut up, but a good mango is probably one of the tastiest fruits you'll have in your entire life. If you have nothing but your hands and teeth, you can rip it open and have a few gloriously drippy moments eating it (hopefully near a place to wash off). There are a few minor problems with this method. A few people get a little rash from the skin, so at least don't rub it all over your face the first time. The other problem is mangoes have strings, and if you scrape the skin and seed with your teeth you'll be wishing you had some floss handy. The most civilized way to eat a mango is to cut it up into bite-sized pieces first. A sharp knife and a sharp spoon will help. But no matter how you eat a mango, it is a tropical delight. Hawaii is famous for its pineapples, and they are at their flavor peak in late summer. Buy as yellow and as fresh (look at the leafy top) as possible. Makes a mess. I like to eat with cottage cheese. Nori is the dried seaweed (also called "laver" I think). It is a great source of nutrients, and adds an interesting flavor to almost anything. The easiest-to-like for new people is the seasoned nori. Nori is lightweight and keeps forever until you open the package. Once opened it tends to soak up moisture from the air and get soggy, but it will keep OK for a meal or two. (The seasoned types have little packets that keep the air dry.) To serve, just use as a wrap to eat rice, poi, or anything else. Zero clean up. These are various rice balls sold in groceries and little neighborhood stores. The most common ones are about twice the size of a pack of cigarettes, topped with Spam or BBQ chicken, and wrapped in nori. There's also a soy covered one that looks like a triangular scrotum. Musubi don't keep forever, but a few hours at room temp should be OK. Just take off the Saran covering and eat. No clean up. Chinese delis have millions of kinds of finger food that most people like. Most have cooked meat and so only keep a few hours. My favorites are the various "manapua" (steamed dumplings with things like pork hash inside). Try some of the others, too. These are a little wierd to some people - soft, WET, salty peanuts. But to others there is no finer way to start on an adventure around the island than to stop in at Fort Ruger market and get a pound of boiled peanuts and a six pack of malt-flavored beverages.